Doorbell cameras are growing more popular, popping up in many Triangle neighborhoods. But does that mean it’s the right solution for your home? 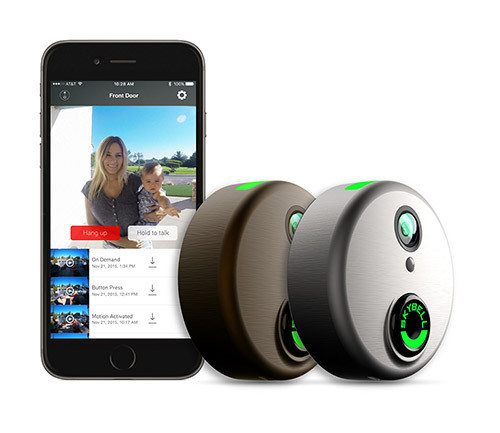 At Secur-Tek, we’ve received more questions about doorbell cameras in recent weeks, so here is the rundown on how doorbell cameras might aid your home security. What is a doorbell camera? A doorbell camera alerts you when someone rings your doorbell. You can speak to visitors through your smartphone from anywhere — just as if you are home. In some cases, the camera will detect motion and send an alert to your phone even if the bell isn’t rung. Some will record video for later use. Why use a doorbell camera? Doorbell cameras have many advantages for busy people. Most home burglaries occur between 10 a.m. and 3 p.m. when no one is home. Now that Wake County year-round schools are back in session, it’s more likely that your house is sitting empty for at least a few hours each day. These days, we might not know our neighbors well enough to rely on them for monitoring our porches — and that’s if our neighbors are home at all. Also, about 33 percent of intruders enter a home through the front door. Many would-be burglars will ring a doorbell first, to make sure no one is home. Burglaries are fast, taking between 90 seconds and 12 minutes, according to the FBI. On top of that, burglaries are difficult to solve; only about 13 percent of burglaries are cleared by police. Pretend to be home by “answering” the door. Monitor movement on your porch, whether it’s a delivery person or someone suspicious. Monitor housekeepers entering your home or get an alert when your child returns home from school. Lock and unlock the door remotely. With some models, you can record video footage of someone if he/she enters your home, making it easier to identify suspects. Video Quality – is it HD and how clear is the image? Mounting Hardware – Some consumers have complained about mounting systems for some of the less expensive models. They have been known to break during the installation process. Be sure yours comes with a solid mounting system. Fit – Will it work for your doorframe? Wires – Hardwired or wireless? Night Vision – Some doorbell cameras offer the ability to record night video. On-Demand – Some cameras let you check the video whenever you want, while others only show you video when movement is detected. Phone Compatibility – Some versions don’t work with all mobile carriers and devices. Make sure yours works with what you have. Contracts – Some of the popular models come with monitoring contracts and may require someone else to install them. Appearance – They come in a variety of sizes, shapes, and colors. We sell multiple types of doorbell cameras at Secur-Tek. Talk to us about whether adding one to your home security system is the right move for you.